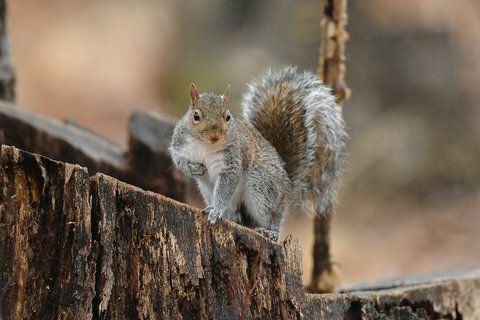 While deer, ducks and pheasants get much of the press when hunting season rolls around, it might be surprising to learn that squirrels surpass all other game species in popularity in the United States. Squirrels are easy to find, plentiful and can offer a unique shooting challenge. Not to mention, they can save an otherwise slow day when other game may be difficult to find. Squirrels offer a great learning opportunity for young hunters, but can also offer a day of fun for experienced hunters. Millions of hunters across the U.S. pursue squirrels each fall. Whether you hunt squirrels every year or you have not hunted them in decades and would like to start hunting them again, here are a few tips to take more squirrels this fall. Find the food: Squirrels will most likely be found near bountiful food sources. Some of their favorite foods include acorns, walnuts, butternuts, beechnuts, hickory nuts and sunflower seeds. Find the food and you will find the squirrels. Stalking: While squirrels in urban and suburban areas show little fear of humans, those in rural areas, where contact with humans is rare, will spook easily, so it is important to move slowly and quietly when you are stalking squirrels. Keep Your Eyes Open: Squirrels will often freeze when they see danger. When the leaves are still on the trees, this can make them difficult to spot. Carefully scan the limbs of trees as you carefully move through the woods, watching for stationary squirrels. Listen: Sometimes the best way to locates squirrels is to listen for them. They make a distinct sound as they scurry through the leaves on the ground or move through a tree. Often, you will hear them before you see them. Get a Good Shot: Since squirrels are small and are often found in trees, they can offer some challenging shots. Make sure you have the best angle possible before pulling the trigger. If you do not have a good angle, the odds are good that you will either miss your target or only wing it. Then the squirrel is likely to disappear, with no chance at a second shot. Best Times: While squirrels are often active all day long, some of the best times to locate them are during the early morning or evening hours. Watch for nests: This is a great tip, especially when the leaves start falling from the trees. When you spot a squirrel nest in a tree, you are likely to find squirrels nearby. Best gun: A .22 is the preferred gun for many squirrel hunters, but some hunters will use a shotgun, bow and arrow or even a hand gun. Finally, it is important not to underestimate the difficulty of squirrel hunting. Squirrels can be as tough to shoot as any other game species. If you keep that in mind and use the same care you would hunting deer or pheasants, you will definitely improve your squirrel hunting success.